The word “café” has immediate associations for everyone. We all know what one is, and in every major city in the world you can arrange a meeting with an acquaintance by simply suggesting a certain café around the corner, a baroque favorite in some odd neighborhood or the famous cafe you’ve read about that’s noted for the literati who frequent it, the film stars, the politicians. The aroma of coffee or pastry comes to mind immediately as does, of course, conversation, maybe even intrigue. The very word “café” is so well known in almost every language, the sound of it so suggestive of sensuous pleasure and intimate communication, that it barely needs definition anywhere. When I first heard the word I thought it referred to jams or jellies, as in the French confiture. Or to a candy or pastry shop, as in the standard Spanish word confitería. But I was in Buenos Aires at the time, and in that city a confitería is far, far more than what’s contained in either of those definitions. It is the very essence of what a café should be. I knew this the moment I first walked into one. The confitería has everything that its French or Italian compatriots provide, plus much else. It is a café and a bistro, an ice-cream shop and a bakery, a wine-bar and a beer-hall, all in the same very well-appointed light-filled room. Sometimes it will even include tango, a feature of which very few cafés in the world can boast. A morning can be spent in a confitería in conversation over a sultry omelette or the smallest, most delicious of croissants, called in Buenos Aires medialuna (i.e. halfmoon). A confession of love or angry disavowal can be made. A plate of fresh fish and potatoes can be yours right away. An afternoon can be spent in the beginning of an affair. Lovely pastas pass by on trays carried by thoroughly engaging waiters. An evening’s solitary reading of a novel can be enhanced by talk over a good steak about that novel with someone you’ve never met before. Customers come and go. The traffic passes by outside while the observant patron reads or talks, asks for another coffee or an ice cream. (Argentines militantly insist that their ice cream is the best in the world, and I don’t argue with them. The dairy products in general of Argentina are among the best I’ve ever had, and I think that’s due to the fact that the entire cattle population of the country is still range-fed.) A glass of Mendoza malbec is just right with a triple sandwich of fine ham and Argentine Swiss cheese, brought to you once again by a most attentive waiter secure in his profession. 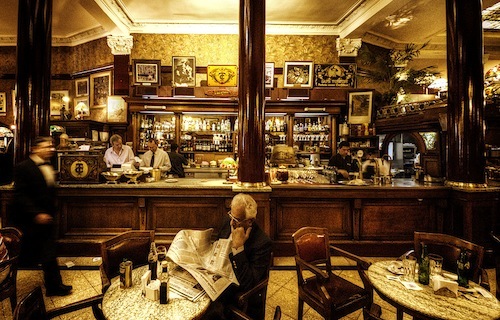 If the confitería is the essence of the idea of a café, the Café Tortoni in Buenos Aires is the essence of the confitería. The Avenida de Mayo is a major thoroughfare in Buenos Aires. A shopping street, it is almost always glutted with automobiles. Its sidewalks are lined with deciduous trees that, during the summer months offer relief from the humidity that rises up from the Plate River. In winter, the street reminds me of the many paintings by Impressionists like Monet and Caillebotte, of rain in Paris. The streets in those paintings are slick, the trees having lost their leaves, their branches reaching into the sky like broken fingers. There is nonetheless considerable warmth in the paintings, because the Parisians are so devoted to light and color, even in the dead of winter. As the light fades in late afternoon, Buenos Aires, like Paris, gains color with electric light, making Winter night-time Buenos Aires one of the most visually arresting cities in the world. The trouble is that Buenos Aires didn’t have the artists that Paris had. 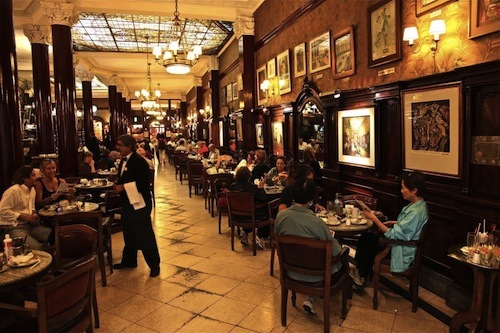 But it did have the Cafe Tortoni at Avenida de Mayo 825, a place that Toulouse Lautrec, Degas or Renoir would have understood and cherished. No matter the season or time of day, the quiet of the Tortoni’s interior belies the swirl of traffic outside. It is, sadly, a favorite on the tourist scene. The Tortoni has a daily smattering of these . . . porcine, slovenly wanderers from everywhere, in hiking shoes or sandals, floppy shorts and T-shirts that advertise American cell phone companies or German football teams or meaningless software products. But really they’re just a smattering. The Tortoni itself barely notices. The real clientele here are porteños, citizens of Buenos Aires who one senses have been frequenting the Tortoni for most of their lives. They read the papers in the morning light coming through the large windowed doors of the café, light that spills across the tables, warming the disputatious information in the newspapers in a quiet glow. This is a café in the grand style, founded in 1858 by a Frenchman named Tounan and named after the famous café in Paris. It is filled with nineteenth century French and Italian wood work, with one of the most beautifully ornate bars one could hope to see. Beveled mirrors make the café seem larger than it is, even though it is already quite a sizeable room, as do the crystal chandeliers, of which there are many. There is a good deal of brass as well in the fixtures, and the café is dotted with glass cases that contain the memorabilia of the many writers, politicians, intellectuals, singers and other luminaries who have made this their usual café. For contemplative and intimate talk, it is a café without equal, and the conversations are many. The Tortoni is a place where business is done at lunch between portentous-looking bankers and lawyers, where directors and money people talk about the next film project or where a mother and her children will pause for an ice cream and a sweet. Wine fuels the talk here in the late afternoon or evening, and that talk has come over the years from such as Federico García Lorca, Robert Duval, Carlos Gardel, Jorge Luis Borges, Artur Rubinstein. Luciano Pavarotti, Hilary Rodham Clinton and King Juan Carlos of Spain. Rubinstein even once played the piano here! Lovers meet here too, frequently, over a couple of cafes dobles and the fluttering intertwine of fingers and whispered words. Indeed love appears as a distinct possibility at The Tortoni simply upon walking into the place. A coffee here is much more affordable to an illicitly amorous couple than an afternoon’s hotel room and its hour of hastened caresses. The final denouement may not take place in the café, but almost everything leading up to it does. Tango is the blood with which Buenos Aires pulses, and great writing adds to that blood. The Tortoni has been a place for both, sometimes separately, sometimes in concert with each other. One of the most famous meetings here took place in 1933 between the Italian playwright Luigi Pirandello and the legendary tango composer and singer Carlos Gardel. Pirandello, the author of Six Characters In Search Of An Author and many other plays, novels, short stories and essays, was an intellectual. One need only look at the sheer bulk of the work he produced to realize that this was a serious man, and according to eye-witness reports from the Tortoni on that evening, he was also distant and cheerless. He was being feted at the café by the local literati when the celebrated Gardel arrived. Gardel was a very different sort of fellow from Pirandello. Like Pirandello a man of the theater, he was a performer, not a writer. So his efforts were public and very elegantly flashy. 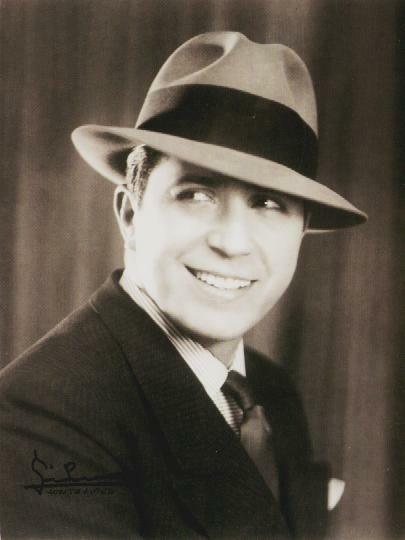 Carlos Gardel was one of the best dressed men of his time. When he went on tour to Great Britain, he regularly shopped on Savile Row with his friend the Prince of Wales, later to be King Edward VIII. He was a friend of the great of every calling. Charlie Chaplin was a fan. He regularly dined with Igor Stravinsky. Enrico Caruso told him that he, Gardel, was the opera star’s favorite singer. Gardel had come to the Tortoni that evening in order to meet Pirandello. He arrived in a Packard limousine dressed in his best, wearing one of the signature fedora hats that were specially made for him in London. He was accompanied by two of his guitarists and, taking the three chairs immediately in front of the Italian playwright, they sat down and performed several of Gardel’s most popular tangos. The hundreds of onlookers in the cafe burst into great, spontaneous applause upon the completion of each number, the sort of applause that greeted Gardel everywhere he went. Pirandello looked on, his white beard motionless in the glitter. When Gardel was finished, he grabbed Pirandello’s hand, shook it with great enthusiasm and waved his guitarists out the door to his limousine, that had remained waiting at the curb. The Packard disappeared into the night, Gardel on his way to another club, another assignation. Gardel died on January 24, 1935 in a disastrous plane crash, having gone against his own better judgment, the only time he’d ever been on an airplane. He’d reluctantly agreed to the flight because of a must appearance that his advisers had insisted was essential to the tour he was on at the time. Tango lives for betrayal. It is a celebration of private pain and individual sorrow. Gardel sung all that, and his death itself was in a way a tango . . . a man betrayed by his friends, who lost his life with a single gesture that went terribly wrong. Edward VIII’s disgrace when he abdicated the English throne on December 10, 1936 would probably have been more understandable to Gardel than his ascendancy to the throne. The King’s embarrassment would have allowed Gardel and his tango common ground on which to discuss a lost youth, a misspent life, frustration in love, all the things about which tangos are composed. A pleasure-seeking, occasionally witty and rather foolish nobleman, the Duke of Windsor became an icon for squandered opportunities, living a very desultory life, more or less rejected by his family, in the capitals of the world, awash in wealth. In terms of personal style, he was much like Gardel, except that Gardel was not rejected. He had been born illegitimately and had gained his first small fame, later to be worldwide, as a street singer in Buenos Aires. As such he had not had a great deal to lose, even though he became a very wealthy man. The Duke of Windsor did have much to lose, and he lost almost all of it . . . except for the few yachts he owned, the many houses and apartments around the world, the estates and limousines and of course his lovely American wife. Gardel, on the other hand, did lose everything . . . the ultimate tango. His spirit breathes in the Café Tortoni, in the very coffee you drink, the sweet you have for breakfast, in the murmurings of the other customers and the soft morning light coming from the Avenida de Mayo. The photos, paintings and plaques that carry his image and that are hung in various places throughout the café commemorate the many hours he spent there talking, laughing and, of course, singing. A great café is always truly of its own setting. It represents the domain it inhabits, and the custom and style of that setting. 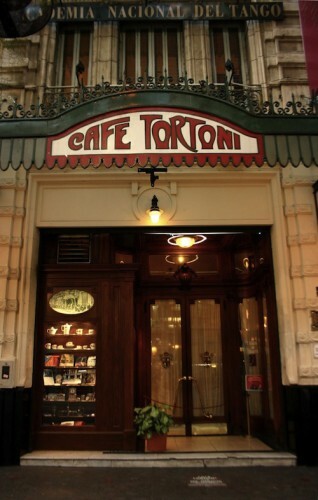 Perhaps the finest tribute to the Café Tortoni can be found in the words of the late and much celebrated Argentine linguist and writer José Gobello, who observed that you can find in the Café Tortoni the entire city of Buenos Aires. 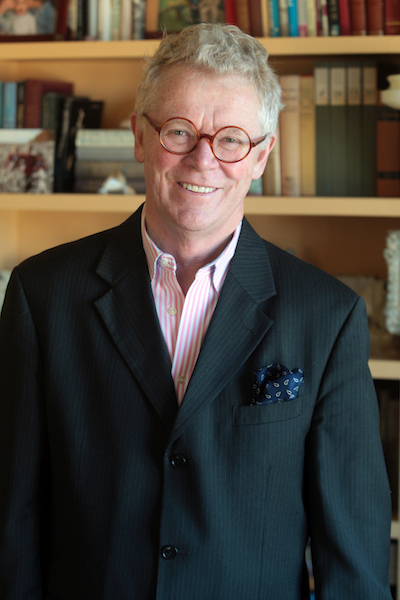 By Terence Clarke in Uncategorized on September 30, 2014 .